Retro Thing: Knight Rider New TV Movie - KITT Is Back! Knight Rider New TV Movie - KITT Is Back! February 17th sees the return of 80's classic Knight Rider to TV screens as a TV movie. This movie-of-the-week is a “backdoor pilot”, which is to say that if the show is successful, NBC will bring KITT back as a weekly TV series. The worldwide hit was the story of David Hasselhoff... er, Michael Knight... driving around inside the real star of the show: KITT. 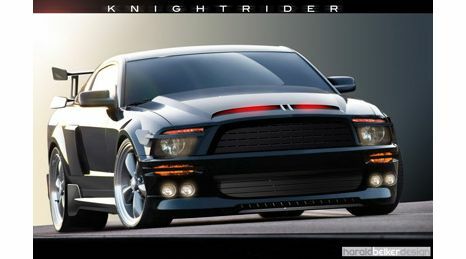 The Knight Industries Two Thousand is an advanced computerized Pontiac Trans Am with an aloof talking computer, tremendous speed, and a turbo boost to leap over any number of sharks (or other hazards) in every episode. The show ran from 1982-86 on NBC and has achieved worldwide fame/notoriety for star Hasselhoff and black Trans Ams. After the visual effects success in last summer's Transformers movie, the producers of the new Knight Rider felt that they'd be able to achieve spectacular digital stunts and chases even on a television budget. Val Kilmer is the voice of the new car after the prior voice actor, Will Arnett was forced to leave. Turns out that Arnett handles voice overs in commercials for a competing car company. Yeesh – politics. "Knight Rider had a profound effect on consumer expectations, and the motor industry reacted accordingly. ...motor manufacturers began offering vehicles with digital LED instrumentation, and even trip computers and security systems which used electronic voice synthesizers which played back "talking" messages to the driver." This must have been written by someone who wasn't alive when the show was originally on. We all know that car makers would have introduced these innovations just as soon as feasible – it wasn't because ardent fans of Knight Rider demanded it. I abhor revisionist history, especially on Wikipedia. 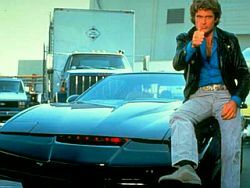 It's enough that Knight Rider became something of a modern classic without imposing fake historic significance on a show about a cool talking jumping car.